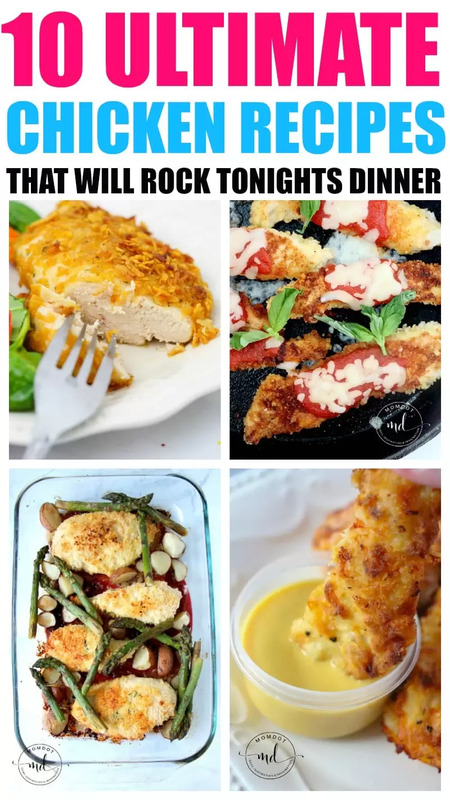 Looking for some fantastic dinner recipe options? Look no further for your chicken recipe meals! I have curated 10 ultimate chicken recipes that will rock tonight’s dinner! And because all of them are right here on MomDot, we know they are quality and perfectly family friendly. Just head to each recipe, print and go- menu planning made easy and delicious. Now let’s get to dinner! Lemon Parmesan Sheet Chicken: This easy chicken recipe makes clean up a snap when you combine your veggies and chicken in one spot. And with a flavorful dinner, this is one recipe that cannot be missed. Chicken Parmesan Fingers: Looking for a Chicken Parmesan Finger Recipe that is perfect for dinner tonight? Look no more! This Chicken Parmesan Finger recipe is begging to be covered in fresh tomatoes sauce and a healthy spattering of mozzarella cheese. Crack Chicken Tacos: a delicious rendition of the chicken taco complete with a kicked up BBQ sauce and a drizzle of ranch dressing. These crack chicken tacos are perfect for a week day, weekend end, or if you need something hearty like I did this weekend, a perfect lunch. Ranch Chicken Recipe: Throw some ranch on it and its everyone’s (including mine) favorite meal. Easily made, you can pair this Parmesan ranch chicken recipe with any side dish for a quick, fun, and perfect week day meal. Creamy Lemon Chicken Recipe: Creamy Lemon Chicken is sure to hit the spot when it comes to pleasing your entire family. Easily made, this sauce of two ways can be customized with Parmesan or left alone with just a lemon and cream base. Copy Cat Chik-Fil-A Strips : These delicious Copycat Chick-Fil-A chicken strips will rock your world and with the dipping sauce- perfection! Chicken Avocado Burrito Recipe: Easily customizable for your own palette, these chicken avocado burritos take taco night to a whole new level. Baked Pesto Caprese Recipe : If you are looking for a fantastic, quick, and pretty meal to serve tonight, try Baked Pesto Caprese Chicken. You don’t need anything heavy or fried to enjoy dinner tonight with just a few ingredients. Plus 21 day fix friendly! Slow Cooker Cream Cheese Taquitos Recipe: Looking for a slow cooker cream cheese chicken homemade taquito recipe? Look no further with these delicious slow cooker cream cheese chicken taquitos, made perfectly during the day so you can rest easy and still enjoy a fantastic dinner tonight. « Make your own Movie Theater Snack Box!